You recently read in the local news that the city will begin construction on replacing the main downtown intersection with a roundabout starting next week. Needless to say, you’re going around in circles (pardon the pun) on whether this is a good thing not. On the one hand, the roundabout should decrease traffic backups, but on the other hand they’re extremely confusing and could be dangerous if people don’t know how to navigate. You know that you don’t really have a personal say in the matter since it has already been decided, but what made the city think it was a good idea? Are they better than normal intersections? Are they safer? Why bother changing? Every year, nearly 800,000 crashes occur at intersections in the United States. This means that 36% of all traffic accidents are intersection related. The Department of Transportation (DOT) estimates that the reason for such a high collision percentage at intersections is that drivers don’t adequately follow the criss-cross design of intersections. DOT analysis shows that “turning with an obstructed view” at an intersection is 335 times more likely to cause a critical crash than at any other location. Based on these facts, the United States has attempted to make intersections safer by slowly implementing roundabouts. Roundabouts are extremely popular in Europe as a way to decrease intersection congestion and collisions. Since roundabouts eliminate the need for traffic to cross one another, side impact collisions and turning collisions are greatly decreased. 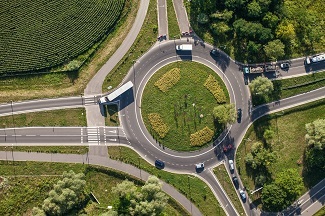 The National Highway Traffic Safety Administration has even included roundabouts as one of its nine proven safety countermeasures for decreasing intersection collision risks. Roundabouts alone are estimated to lower risks by nearly 82% over traditional intersections as a result of unique design and safety benefits that normal intersections lack. Fewer impact points. Roundabouts all but eliminate head-on and high speed right angle collisions by limiting impact sites from 28 potential collision points (normal intersection) to eight possible points (roundabout). Increased crosswalk safety and visibility. Roundabout crosswalks are placed farther ahead of the entrance points than normal intersections (making it easier to see pedestrians before turning). These crosswalks are also broken up into sections, so pedestrians do not have to walk as far to get to safe ground. Fewer acceleration crashes. Since the traffic flow is fluid, cars don’t have to stop and then accelerate abruptly. Decreased road rage. Traffic flow is increased, while backups are decreased, lessening frustration, stress, and anger which could have potentially lead to road rage collisions in traditional intersection traffic. Although roundabouts are considered to be safer than other intersections, reckless and poor driving can still put your family at risk. If you or a family member has suffered from serious injuries due to a roundabout car crash, you may be entitled to damages and injury compensation. Don’t allow your insurance company to give you the run around—let an experienced car wreck attorney help you find the most direct path to your injury settlement. Contact us online or call us directly at 817.380.4888 for a free consultation and review of your case. We help injured car accident victims throughout Texas including Arlington, North Richland, Grapevine, Bedford, Hurst, Euless, Irving and all points in between. Roundabout Navigation: Are You Going Around in Circles? After a car crash in Texas, is the other driver always held responsible for my injuries?